THE SNP claims that a general election victory in Scotland next week would complete a “triple lock” for a second independence referendum. The party’s manifesto, launched by Nicola Sturgeon in Perth yesterday, says if the SNP wins a majority of Scotland’s 59 seats on June 8, that will reinforce the existing mandate from their win in last year’s Holyrood elections and the vote in the Scottish Parliament in favour of seeking a referendum. Polls suggest the election will see the SNP emerge as the biggest party in Scotland by some margin even if it cannot equal its 2015 success of winning 56 out of the 59 seats. Ms Sturgeon indicated a fresh vote on independence may, however, be delayed beyond her proposed timetable. She said: “I’ve said autumn 2018 to spring 2019 for a reason – because that’s when Theresa May is saying the Brexit process will end, so I have taken her at her word. 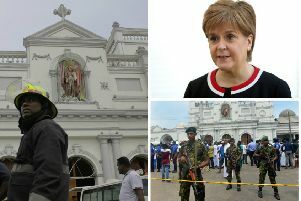 Ms Sturgeon said a majority for her party would also provide a “more immediate opportunity” to “make sure that Scotland’s voice is heard” in the Brexit negotiations. She said being taken out of the EU and the single market would put 80,000 jobs in Scotland at risk and would pose “a real danger to our farmers and fishermen, our universities, our food and drink businesses, to almost every sector of our economy”. The manifesto spells out the SNP’s opposition to the UK government’s controversial immigration skills charge, which imposes a £1000 a year levy on employers taking on skilled workers from outside Europe, soon to double to £2000. And the SNP adds it would oppose extending the charge to EU workers after Brexit. The stance was praised by the Federation of Master Builders Scotland. Director Gordon Nelson said: “The industry is suffering from a severe skills crisis and to combat it construction firms will, at least for the foreseeable future, need access to migrant labour without having to overcome enormous financial and bureaucratic hurdles.